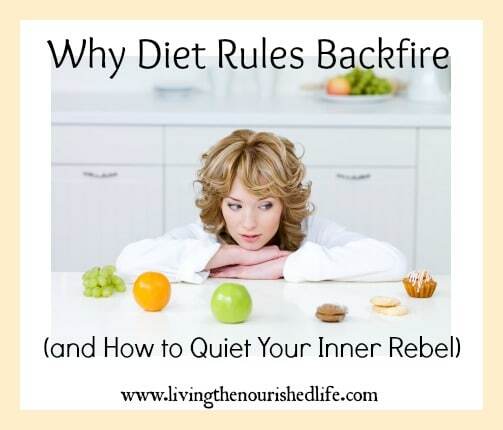 Ever wonder why diet rules backfire and how to quiet your inner rebel? The rebellious teen is a cookie cutter stereotype if there ever was one, partly because it’s based in reality. You know those in-between years when we battle between lingering immaturity and the desire to come into our own destiny. It’s a time when sometimes rules are broken just because they are rules, even if they were meant only to serve us. Most of us have matured beyond the flagrant defiance of our teenage years (well, hopefully), but most of us still have a little of that rebel left inside us, ready to strike out when rules become too rigid or when life separates us too much from who we want to be. And when we diet. Always when we diet. The story goes something like this: XYZ diet is the best diet for me because I should [lose weight, get healthy, detox my liver, purify my soul, etc.]. Therefore, X foods are good for me and I should eat a lot of those. And Y foods are okay for me but should mostly be avoided. And Z foods, well, they are just straight up poison and I should never touch them again. The problem? Every “should” you just told yourself is nudging your inner rebel out of hibernation. At first, the inner rebel doesn’t say much. It’s being squelched by the rush of adrenaline and excitement that comes with starting the XYZ diet. This rush overpowers any rebelliousness (and possibly even common sense) for a few days or weeks. Then comes the moment you swore would never come again. The moment where the low-carber inhales an entire loaf of fresh-baked bread. Or the low-fat dieter devours ten rice cakes slathered with peanut butter. Or the sugar-buster swallows massive spoonfuls of rocky road ice cream right out of the container. How did we get here? We knew better. We knew all the rules, about the X foods and the Y foods and the Z foods. How did we know so much and then go running in the opposite direction? Are the rules just flat out wrong? Sometimes, but not always. Occasionally they are even based on sound science. It’s not really the rules themselves that are so wrong, but what you tell yourself about them. You don’t rebel against the rules and suggestions. You do rebel against the idea that you should, you must, you have to follow them. These “shoulds” and “musts” put pressure on you to follow the XYZ rules, and give you no flexibility to listen to your body and find what works for you. Your inner rebel wants you to be safe and accepted. Sometimes your inner rebel exists to defend you. It rears its ugly head when you get the idea that somehow you aren’t acceptable or worthy as a human being when you don’t follow the XYZ rules. And this is a hidden agenda of many diets, to make you feel morally superior if you follow the rules, and horribly inferior if you don’t. Well, I don’t have to tell you that no one wants to feel like a worthless sack of manure. It’s only natural to want to rebel against this feeling (and then eat a whole pan of brownies to prove it wrong). Your inner rebel want you to be heard and recognized. Diets tell you one thing very clearly: you are unreliable and even dangerous. Listening to yourself is crazy. 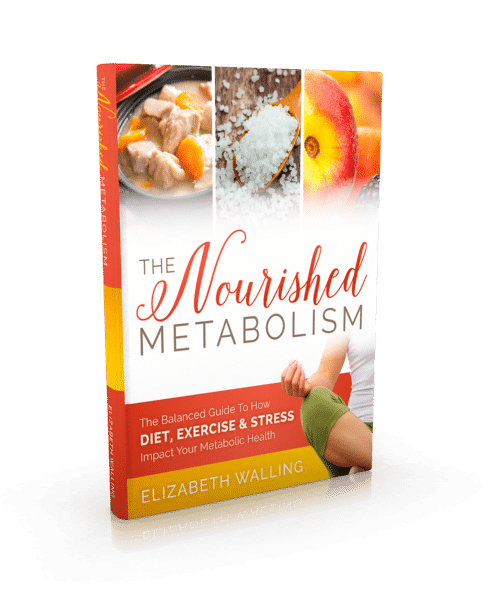 You are so messed up that the only way you can live a decent life is to ignore your own instincts completely and give yourself over to the XYZ diet rules. Your inner rebel hates this feeling, because it believes you are an intelligent, capable person who can make sound decisions (at least most of the time) with the right information and perspective. When you look at it this way, you realize your inner rebel isn’t really trying to hurt you. It’s actually coming to your defense (though not always in productive ways). Its intentions are ultimately positive, though its execution often does more harm than good. The key to eradicating patterns of rebellious behavior is not to suppress, coerce or threaten your inner rebel (that didn’t work on you when you were a teenager, did it?). Instead, work to understand the underlying causes of your rebellion and then eliminate those. Accept yourself. It sounds trite and cliche, but don’t underestimate it. Being okay with who you are is a vital part living a fulfilling life. It’s okay to strive for improvement in your life, but in order to make truly positive and lasting changes, you have to accept yourself as you are right now. You can’t hate yourself into having a good life. Learn to listen to your body. Don’t let anyone tell you that if you listen to your body, gluttony and degradation is the only possible outcome. Your body doesn’t want to live on carrot sticks and rice cakes–but it also doesn’t have any desire to be stuffed with cheesecake until it can’t even walk. There is a healthy balance that can be found through learning what your body wants, needs, and thrives on. Apply your knowledge about nutrition without setting up rigid rules and requirements. I’m a geek who thoroughly enjoys learning about nutrition and biology, but I’ve also learned that strict eating regimens always backfire. Make what you learn work for you, instead of becoming a slave to your knowledge. The inner rebel does not want to take over your whole life–it doesn’t really have the energy or capacity for that. Instead, it wants your life to come back into a beautiful balance where its presence becomes unnecessary. Rebellion becomes superfluous and simply disappears. love this! i wasn’t able to get fit until i understood why i made poor food choices, listened to what my body needed, and learned how to nurture my mind and body. then, adopting a healthy lifestyle felt like a reward and not a punishment. Great comment! You hit the nail on the head. It sounds like you made changes in a truly healthy way. I agree and I’m glad to hear somebody saying this. I’m a big fan of replacing unhealthy foods with better ones. Restricting just does not work. It’s like somebody saying, “don’t look over there!” Of course you are going to look. Exactly! When you focus on moving toward positive, holistic changes, then many times bad habits simply fall away. I’m bookmarking this post and coming back to it anytime I feel the inner rebel coming emerging. You’re welcome, Sarah, so glad you enjoyed this post! It is so true. That rebel inside of us is our need for autonomy speaking loud a clear. Thank you so much for sharing, Christie! 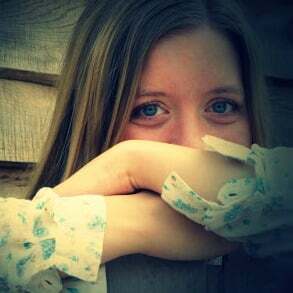 Your blog is so incredible, I’m honored that you stopped by and enjoyed this post. Thank you for this. I have really struggled with healing after multiple illnesses that packed on a lot of extra weight in a short amount of time. I used to be a dancer, now I am fat! The last few years (and weirdly..beekeeping) have done a lot to learn to accpet where I am at and work on feeling good first. Your statement “you can’t hate yourself in to having a good life” really hits it for me..and happily, most days I don’t anymore. Nourish your body, enjoy the process. I really love following this blog..very inspirational. Thanks, Schelli! Society tends to foster (and even encourage) self-downing comments–it can definitely be a hurdle just to learn to love yourself and be patient with yourself. But it really is so worth it to make that mindset change. Schelli, I too have struggled with healing from multiple health issues and because of these health issues I gained a lot of weight in a very short amount of time and now I am not only struggling to get back my health but to also lose the weight. I am so frustrated and most of the time I find myself putting myself down and really hating on my self. I need to learn how to accept where I am at and to love myself but I am so struggling with this. I would be interested in what you did to get to this place. Your comment along with this post really encouraged me and I just wanted to say thank you! I so appreciated this post. For all of my life I was thin due to an active lifestyle and eating a whole foods diet for the most part. Other than the normal dieting teen girls(I didn’t need to be dieting 🙂 do I never really had to work at staying thin nor had I ever been fat. At least not until a few years ago when I gained 30-40 lbs in a very short amount of time and regardless of how little I ate or how much I worked out…found out it was the result of multiple health issues..hypothyroid, hashimoto’s, adrenal exhaustion, and hormone issues. Whenever I try to diet I gain weight. Because of the adrenal exhaustion I am not allowed to work out. And in all reality I am too tired to work out anyways. I am starting to seek out different doctors now since I haven’t found the right answers yet. I can tell myself all of this yet I feel so horrible about myself and the way I look that I just hate myself. I don’t feel like me. I don’t look like me. I doubled in size. I don’t want to leave my house because I am tried but also I don’t want people to see me. I am embarrassed of myself. I look like I just let myself go and that all I do is eat junk food which I don’t do. Lori, I think a lot of women can relate to what you’re feeling! Sometimes there’s an underlying fear that if we love our bodies, that means we’re giving up on ourselves. Our diet-centered culture promotes the message that accepting yourself is a cop-out, that you’re only free to accept yourself if you fit the “ideal” image. I understand why we tend to think that way (there were times when I’ve certainly felt like that), but it’s a very harmful mindset. The truth is that you can acknowledge that your weight isn’t where you want it to be, but at the same time love and respect yourself. Even if you feel like you can’t love and accept your body, at least start with just respecting yourself. Respect means no name-calling, no negative labels, no hateful comments. Respect means taking care of yourself–physically, mentally, emotionally, spiritually. You deserve that respect at any weight, period. You deserve to dress well, go out with friends, and experience life at any weight. Don’t let anything–even your own thoughts–persuade you otherwise. Loved this Elizabeth. You’re right, rigid protocols never work because they’re not sustainable. Focus on what makes your body feel good and your brain feel happy, and the other stuff seems to just fall away…except for that occasional, perfectly ok treat. Thanks for your great thoughts. Exactly. Glad you enjoyed the post! Great article! Think I’ll share it with my friends. Thanks so much for articulating what has been floating around in my mind for the past year. I have been successful for the first time in my life in eating well and the result has been losing weight. I have tried following rule oriented diet plans and that rebel would come out and take over every time. Now I have been able to listen to my own mind and body and find out what it needs and desires. 85 pounds later and off more medicines than you can shake a stick at I am still at a loss when people ask me how I did it. The key really has been to let the should and have to’s go. Thanks again for putting into words my journey! SO true. I’ve tried a million different diets, but then I turn into a binge eater, and at that point I have to heal myself from binging, too! I love your thoughts on the subject! Thanks, Hope! I agree, diets cause so many more problems than they solve. I am just starting out on my journey to liking my body enough to not rebel. 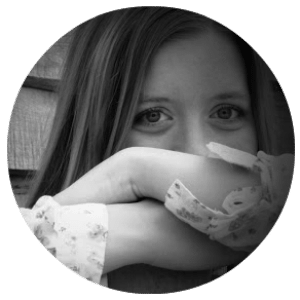 I was diagnosed with IBS and placed on a low FODMAP diet which is very restrictive. But because I was placed on it the XYZ rules came from someone else, so I rebel them, even though the consequences are bad. So I’m trying really hard to create a relationship with my body that prevents this, and your post struck a chord with mW. Have you read the book Intuitive Eating by Resch and Tribole? If not it’s amazing. It talks about listening to your body and getting rid of the diet. Wonderful book and seems very much to be like what you have been talking about. Yes, I’ve read it, but it’s been a few years. Excellent book. “You can’t hate yourself into having a good life” <<<THIS. It also took me awhile to realize I couldn't hate my body on the way to having a body I'd love. 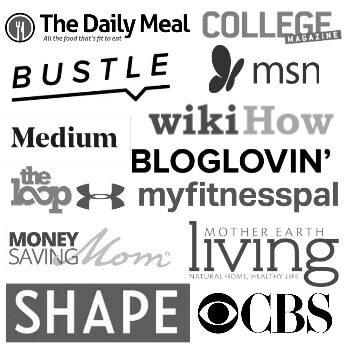 I stumbled over your site after spending another weekend binge eating. I am now at the hating and disgusted with myself stage with the absolute terror of doing it all again tonight. So much of what you say could have been written solely for me. The 10 positive reasons turning to 10 negatives. I hide myself away not attending social occasions until ‘I lose that 10 pounds’. Not booking a holiday until I lose that 10 pounds. So basically I go to work come home and eat. ‘You can’t hate yourself into having a good life’. OMG when I read that something seemed to shift. Thank You. I don’t know what tomorrow will bring but I am going to approach it with that mantra. Does your book come in print?